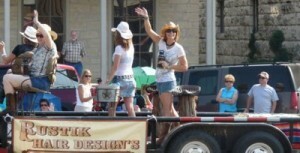 The parade down Main Street is the official opening of the 128th Gillespie County Fair. One of the Hill Country’s biggest parades has over 100 units, marches down Main Street and includes floats, marching bands, riding clubs, community groups and more! All are welcome to participate! The parade begins at 10 am and usually ends around noon. The police will block Main Street this morning beginning about 9:30 am. Check out is still at 11 am, but you may not be able to get to our office until after the parade. As long as you leave your accommodation by 11 am, you can return the key at any time. The best place to view the Fair Parade is from Marketplatz. The parade should not disrupt check-ins, since check-in is at 3 pm. Laughlin Homes and Restoration, Inc. Wins 2016 Star Award from Texas Builders... Thank You, Veterans!